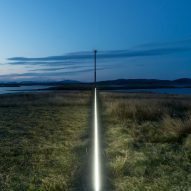 Finnish artists Pekka Niittyvirta and Timo Aho have shone three lines of light across a Scottish coastal town in this installation that aims to show the impact of climate change. 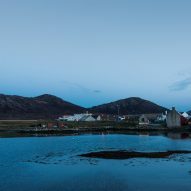 Niittyvirta and Aho installed a series of sensors on North Uist in the Outer Hebrides of the Scottish archipelago that interact with the tide. 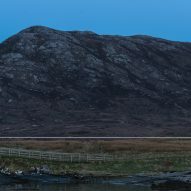 The sensors activate three synchronised beams of light, which represent a scientific estimate of the level that the sea could rise to if the earth continues to warm. Called Lines, the installation – which cuts across the walls of a number of surrounding buildings – aims to serve as a visual warning of the long-term effects of climate change on the environment. "The installation explores the catastrophic impact of our relationship with nature and its long-term effects," said the duo. 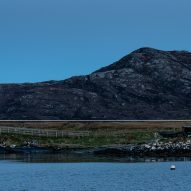 "The work provokes a dialogue on how the rising sea-levels will affect coastal areas, its inhabitants and land usage in the future." The lights were mounted onto aluminium channels that attached either to the walls of buildings or to steel stems protruding from the ground. These were connected to sensors that activated the lights when there was a change in the tide and therefore the water-level. "Art has the potential to convey scientific data, complex ideas and concepts, in a powerful way that words or graphs fall short of. Hopefully, through this work, people can better visualise and relate to [the] reality," said the artists. 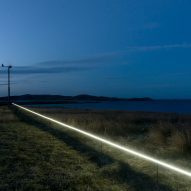 The pair wanted to choose a remote location next to an ocean that was already affected by the surrounding waters for the installation. 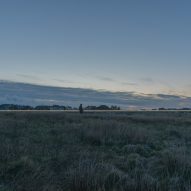 "The creative process had a lot to do with a connection and co-existence between the contemporary society, development and oceans. We started the project within the context of physical positions of seaside communities and their futures," they said. 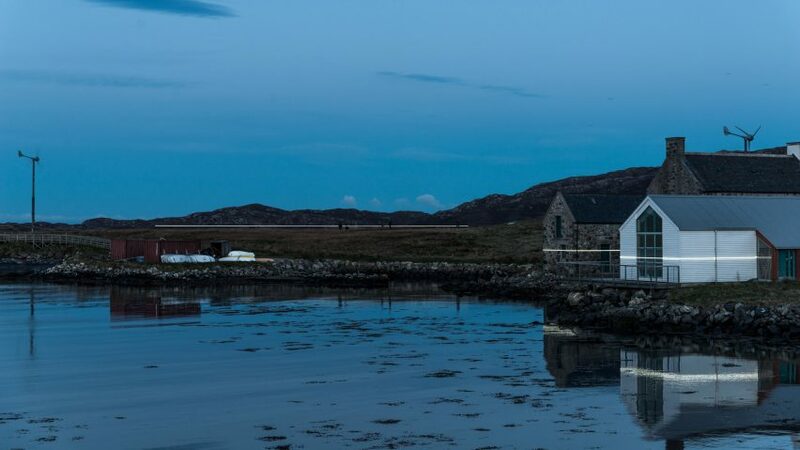 "We found out that the arts centre in Lochmaddy (Taigh Chearsabhagh Museum & Arts Centre), where the installation is situated, cannot develop due to the storm surge-heights so the sea-levels are already a real issue," they explained. 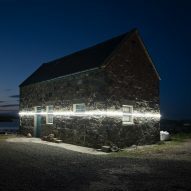 LED neon-rope lights were chosen to demonstrate to visitors the "not-too-distant reality" of rising sea-levels as a result of climate change. "Humans have been influencing the climate since the beginning of the industrial revolution and the effects have only been accelerating. LED lights visually resonate with contemporary consumer society," said the artists. "We felt that this solution possibly illustrates dystopian projections of the sea-level rise in the most tangible way: a threat that is encountered within coastal communities all over the world," they explained. In a similar attempt to highlight the effects of climate change on the environment, last year Danish-Icelandic artist Olafur Eliasson extracted 30 blocks of glacial ice from the waters surrounding Greenland and placed them in public spaces across London, where they were left to melt.